What are the odds on an extension of article 50 and the circus keeps going? If you can't make a decision, don't make one, right? Higher than just about anything else that might happen. Extending article 50 takes away the threat of a no deal for now, hence it's a priority. This would also make a showdown with the Brexit wing/ERG inevitable. But that has been coming at least since a by now largely forgotten PM tried to use a referendum to placate them. Edit: One example of what I meant earlier. Parliament is not going into the gentle night quietly. An alternative to a series of indicative votes would be a cross-party plan, led by former Conservative cabinet ministers Nick Boles, Oliver Letwin, and Nicky Morgan, to try and reverse the "default" setting by which Britain leaves the EU without a deal on March 29. The plan would see the EU Withdrawal act amended by a bill which dictates that May must ask for an Article 50 extension if parliament can't agree on a Brexit option. The bill would also give parliament that chance to devise an alternative Brexit plan which the government would be legally required to follow. This move would be as radical as it sounds, ending the parliamentary convention which dictates that that only the government can provide time to introduce legislation. It would fundamentally challenge the idea that the executive branch — the government — steers the passage and direction of legislation, handing MPs across the house the right to steer Brexit in whatever direction they should so wish. The question is how much support it can command. There is overwhelming opposition to a no-deal Brexit in parliament and MPs may decide this bill is not the best mechanism to avoid such an outcome. There are also questions about whether such a bill could find time in parliament, where convention states that government business takes precedence. However, senior parliamentary officials told Business Insider this week that an amendment to next Monday's prime ministerial motion on the Brexit next steps could allow the bill time to pass parliament, if allowed by the Speaker John Bercow. It's a long shot but it could just about happen. I title this piece of art, Four Red Lines Make A Box. The fifth solution is the magic unicorn. That picture is simply wrong. A CU does not eliminate a need for a border. A CU, in fact, removes the need for only a tiny number of checks. This has been known for years and yet people keep saying it! Don't want to take my word for it? How about Michel Barnier? This slide shows which checks a CU would remove. The removed checks are crossed out in red. Checks that are not crossed out, remain. (Also UK-NI CU is a silly term. NI is part of the UK, not separate from it. If we must use a term, GB-NI CU would be far better. Also, as Taure is want to point out, nothing in the next of the Good Friday Agreement precludes a hard border, though some might argue it breaks the spirit). That graphic has simply quite the different point. The solution is also self-evidently obvious: Don't Brexit. Regardless how you shake it, either Brexit is not happening (Norway+ is not Brexit), or the GFA is not happening. Everyone is thoroughly boxed in by red lines. That is what the graphic wants to show. I grant you, though, that the average Brexiteer couldn't care less about NI or any sort of agreements. I suppose that qualifies as a solution as well. Well, there is one important distinction there, which is the point about compliance with international treaties. A hard border between ROI and NI is not breaking a treaty, even if it frustrates the intended effect of a treaty. While that distinction is purely semantic with respect to the Irish peace process, it is an substantial distinction with respect to whether Britain has complied with its obligations under the law of treaties. Legal compliance is, for some, something to be valued in and of itself. That's all well and good but good luck trying to convince the Derry man with a panel van full of fertiliser. A look at behind the scenes before the vote Tuesday, especially with regards to who sets the order of business we talked about earlier. It's infinitely more fascinating than your average parliamentaty machinations, because Britain has no written constitution, only precedence. If someone wants to do the Wizengamot political!Harry, read up. Cooper's amendment is therefore not directly intended to extend Article 50. It is intended to clear the way for her bill, which would then extend Article 50. It strips back government control over the Commons for one day: February 5th. And on that day, she plans to ram her bill through parliament. It does this by targeting various standing orders - rules for the way the House operates - and assassinating them. So standing order 14(1), which gives government business precedence, is killed off for the day. Standing order 41A, which can put off a vote until another day, is also butchered. Any mechanism which would allow Brexiters to filibuster the bill has its throat cut in a back alley. Then it allows amendments ahead of second reading, which would massively speed things up. It's like if a piece of backbench legislation was zapped by lightning and given super powers. It does to the bill what happens to Neo at the end of the Matrix. All his opponents start to move in slow motion and he is imbued with extraordinary abilities. But he's still not God. Neo had two more films of increasingly convoluted and self-important existential philosophy to get through. And Cooper's bill would face similar problems. After second reading, it would still have to go through committee and report phase and then third reading. That's not just in the Commons. It involves the Lords too. Her plan is clearly to try and clear as much of this as possible on February 5th, but if the government was really keen on no-deal and intent on killing this thing dead, they might still be able to delay it until it was useless. That would be constitutionally shocking. The bill would clearly have the support of the House, not just on its own second reading but by the extraordinary step of having accepted this superhero formula amendment to create it. But we are in constitutionally shocking times and nothing can be ruled out. Cooper's amendment is a valiant and highly credible effort to prevent no-deal. But a government really committed to blocking it could probably find a way to do so. And if you now consider that this thing has a shot at actually happening, you get a perspective of how extraordinary the situation is. Constitutionally shocking times indeed. The government always has its old standby last-resort: appoint a large number of Lords all at once, making sure you pick people who support your position, and stuff that chamber so as to shift the balance in the government's favour. the monarch were given clear and firm Prime Ministerial advice that she should withhold her royal assent to a Bill which had passed through the Houses of Parliament, it seems to be the case that the monarch should follow that advice. I don't think you need to go that far. Cooper's amendment changes the Common's rules to prevent filibustering but, for obvious reasons, it can't change the Lords' rules against filibustering. The Lords also don't have guillotine motions, meaning a few Brexiteer lords could block the entire thing. Normally the government could fall back on the Parliament Acts (or the threat there of) to break through such a blockage but that is obviously not the case here. No time for the Parliament Acts before the deadline, either the no deal deadline itself or the one day the Cooper amendment marks off for this bill. Labour and Liberal Democrat peers insist that the huge majority opposed to a no-deal Brexit in the House of Lords would invent new rules, if needed, to get the bill through. Which, again, is amazing, but see above. I've never looked into this any further, so I can't comment, but I do know that if Cooper's amendment passes and May can't help triggering it, I'll take the 5th of February off from work to watch parliament TV all day long. A "no deal" brexit becomes even likelier. While the position that parliament does not want a "no deal" scenario passes the actual amendment that hinders one doesn't. Thus, if I understood correctly, if no deal is made, the UK will leave as per the treaty with no deal. Tusk says no renegotiation. Which is in line with what representatives has said in the past, I see no reason to suspect they'll cave at the last minute. 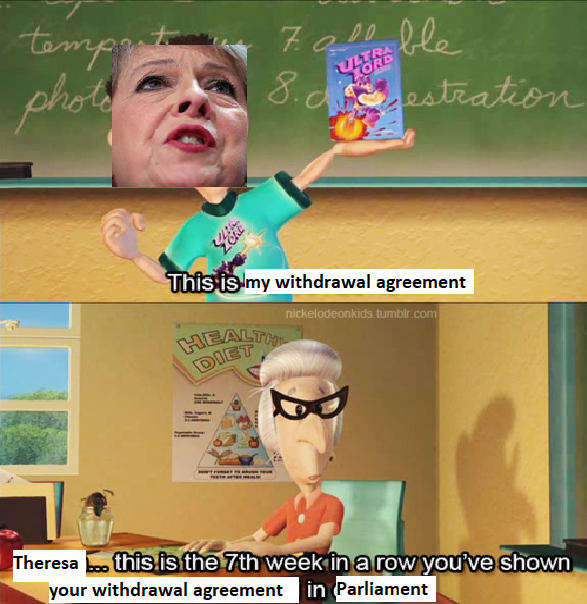 the UK parliament won't approve the deal as is, thus they'll leave without a deal. Been seeing some news about spots of panic around the continent. While the UK will have its setbacks, has the rest of the union prepared? It's Swedens fifth biggest trading partner so disruptions could be amusing. Don't forget the toilet paper. On the upside, all that hiking expertise might come in very handy.